Since 2003, PT Angels Products has been participating with Indonesia’s Environment Concern Movement (Gerakan Peduli Lingkungan) together with 20 other factories around the area of Bojonegara Regency, Pulo ampel and Serang District. The Environmental Concern Movement was established with the intention of improving education by giving out scholarships to the local people. In addition, PT Angels Product’s concern also includes the community around our factory, represented in the form of our Corporate Social Responsibility (CSR) in assisting the community’s activities, religious activities, youth and especially the fishermen around the factory area. PT Angels Products is actively involved in the community’s annual events which include animal sacrifices (for religious purposes) and Idul Fitri by giving out sugar to the communities of two villages (Bojonegara Village and Margagari village) located nearby the factory. In our efforts to fulfill the provisions for the preservation of the Environment, PT Angels Products strives to continually improve our liquid waste Management Unit. Currently, the capacity of our Liquid Waste Management Unit is 2,100 m3 and is capable of processing approximately 600.3 m3 of liquid waste daily through an anaerobic process which fulfills the quality standard of Indonesia’s Environmental Policy No. 51/Men.LH/10/95. Solid waste that has been processed is stored in the shelter to minimize any foul odor. The solid waste is then dried and is reviewed for possible use. 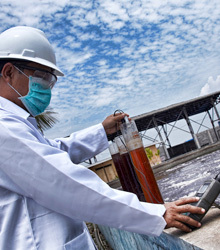 PT Angels Products also works together with third parties to use the solid waste in fertilizer production. Being located near the sea gives us greater motivation to conserve the mangroves near the surrounding areas. The mangroves clean and filter contaminants or pollutants in the sea. PT Angels Products has planted mangroves along the shore bordering of our factory. To further maintain and enhance the greenery in the beach, we will continue to provide mangrove seedlings. Our efforts to preserve the environment has fulfilled the requirements of the Ministry of the Environment according to the performance Rating Evolution of Environmental Management (PROPER) 2005-2007, 2008 up to 2010 a Blue Rating.